A yellow haze coating an empty corner of post-apocalyptic France clouds our vision in Jean-Pierre Jeunet and Marc Caro's Delicatessen, a marvel of the senses from two highly imaginative minds. As the camera pans towards a small butcher's shop, the directorial pair introduces us to the extent of humanity's flexibility in the wake of, well, some disaster. No, we have no clue what's actually happened, nor how long everything's been this way. The delicatessen is just ... there, with a cluster of fidgety people filing to the counter for the meat the butcher (Jean-Claude Dreyfus) has to offer, with satchels of corn in-hand as payment instead of currency. Only, when they talk about shoulders, they're not talking about from a slab of beef or pork. Therein lays both the dark twist and the sick comedic angle behind this creative work of art, which somehow excels at being delightful, sickening, and visually stunning all at the same time. The gloom only heightens once amiable ex-clown Louisan (Dominique Pinon) enters the picture, who arrives at the butcher's shop in hopes of taking an open handyman position he spotted in the paper, colloquially titled "Hard Times". In fact, the ad is actually a lure, a way to get semi-burly men (or women, I suppose) to the building so that the deli's shelves can be restocked with "fresh produce" for the tenants in the upstairs apartments. After the butcher gives him a reluctant once-over, Louisan gets the job, which involves doing muscle-building odds-'n-ends for both the deli and the hostel-like apartments that reside above. It's here that we meet the odd folks holed up in this eerie corner of abandoned society, which includes a pair of toy makers cranking out those "moooo" rotating sound makers, a suicidal woman who doesn't have the gall to advertently kill herself, and a sweet, vision-impaired cellist daughter to the butcher, Julie (Marie-Laure Dougnac) -- who takes a romantic interest in Louisan. 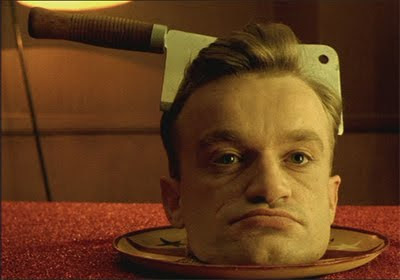 With parallels to early David Lynch and Terry Gilliam, and even a healthy splash of Tarkovsky's Stalker, Delicatessen bundles the components of its post-apocalyptic setting into a bizarre flourish of artistic whimsy. Shot by gifted cinematographer Darius Khonji (Se7en), it creates a sense of isolation outside the deli through those dusty shots of dilapidated buildings coated with a dense yellow fog. On the inside, however, the pallid shades become warming, even oddly inviting as the camera moves across found objects in the characters' apartments -- the posters and ruby-red monkey costume in Louisan's room, Julie's tea set and treats, and the oddly-symbiotic environment in an old man's wading pool of a basement apartment where he raises, and consumes, snails and frogs. Jeunet and Caro tinker with these bits within the brash-yet-alluring palette, but rarely without some figurative point behind them. As the ex-clown goes about his errands with a bounce in his step, painting the ceiling in one apartment and fixing the squeaks in the bed's box springs in another, Delicatessen focuses on the apartment dwellers' eccentricities in a dark, voyeuristic fashion that's rich with detailed creepiness. It becomes an idiosyncratic farce of the way these people cope with what's essentially the "end of the world", along with how they stomach their alternate form of nourishment and maintain something resembling a status quo. Yet the rendering of these highly-animated characters, some shrewd and others affable, isn't repellent; instead, their obscurity draws us in, even becoming playful amid botched suicide attempts and noise boxes that mimic sounds of animals that no longer exist. That's not even taking the vegetarian Troglodins -- tunnel-crawling, wetsuit-wearing food hoarders -- into account, whose antics will eventually permeate the film's third act. Bleak, near-laughless wit stirs in the building because of this peculiarity, but that's exactly what Jeunet and Caro want us to feel. And it works. As the oddness persists and Louisan's time on the chopping block inches closer, Delicatessen excels as a melting pot of moods -- a soupy swirl of repulsive, warm-hearted, romantic, and unsettling tempers -- that bursts with originality. More often than not, the directorial duo experiment with the tones it generates into compellingly juxtaposed scenes, such as the "date" Louisan and Julie share that blends our awareness of the building's cannibalism with the charming fumbles of their romantic link. The most blatant exercise of their playfulness would be an absurd rhythmic sound sync between all the tenants, where rug-pounding, toy-screwing, and roof-painting follow with the squeaks under the butcher's bed mid-amore with almost a Pied Piper-like obedience. Where the front of end of Delicatessen relishes in the deviant quirks of its tonality, the final act scrambles to find a zenith in the many threads of oddity it spins. As it does, while guiding us through the Troglodin tunnels and heightening the tension in the apartment building, the otherwise deftly fluid structure of this black comedy begins to showcase a lack of clear vision at the end of the tunnel. It explodes into a chaotic turn of events which borderlines on the absurd, yet the means reach an invigorating conclusion -- with a beautifully cathartic final sequence -- that justifies the zany, amusing twaddle Jeunet and Caro concoct. These are forgivable caveats for this moody play on macabre decencies, one that's as sly with its humor as it is with its out-of-the-box construction, and it's a stunning achievement well worth seeing many times over for its rich aesthetic and quirky heart.